Owing to the ubiquity of web applications in modern computing, the server software that delivers applications is an attractive attack vector for would-be malicious actors in cyberspace. 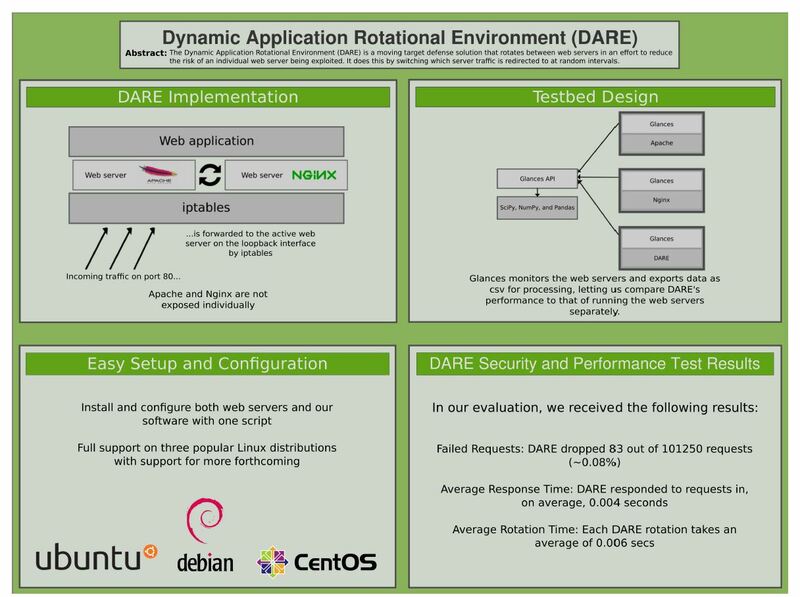 Dynamic Application Rotation Environment (DARE) MTD uses the two most common and freely available web servers, Apache and Nginx. It runs a single application on both platforms, redirecting incoming traffic to one server or the other at a random interval. The goal is to mitigate any unknown vulnerability in one of these platforms by reducing the amount of time that platform is exposed to a would-be attacker. Like the MORE MTD strategy, this variability increases the cost of reconnaissance on a target and reduces the likelihood of exploiting any zero-day, or previously unknown, vulnerability. One virtual machine (VM) is selected at a given time to handle all network traffic, and it is known as the active VM. At a predefined interval, which may be as short as 15 to 30 seconds, the active VM is switched. When a VM becomes inactive, the integrity of the file system is checked for signs of attack and removed from rotation if any integrity compromise is detected. The procedure mirrors MORE MTD, which set the lower rotation window to 60 seconds.